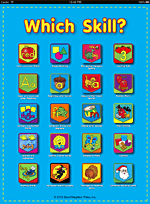 Help young learners develop early childhood basic skills! 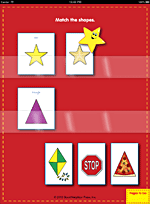 These simple matching games emulate the classic classroom pocket chart learning system. Happy music and cheerful voice prompts encourage learning fun. All 21 of our previously released apps are included. Click the link below and go to the Apple Store for the complete listing of games included. Buy it now at the iTunes App Store. Learning colors is fun with your iPad! Teach young learners (ages 3-8) colors and color words with this simple and clever matching system! Colors and Color Words requires 3-5 minutes for a young learner to complete, making this iPad app ideal for students with short attention spans or those requiring highly visual or tactile learning experiences. Learning shapes is fun with your iPad! 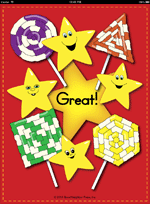 Teach young learners (ages 3-8) shapes and shape names with this simple and clever matching system! 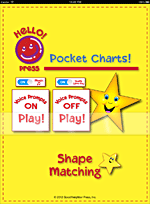 Shape Matching requires 3-5 minutes for a young learner to complete, making this iPad app ideal for students with short attention spans or those requiring highly visual or tactile learning experiences. Word Match! Help develop early childhood skills (ages 3-8) in both pre-number math and literacy by teaching position words to your young learner. Understanding relationships like top/bottom, inside/outside, around/through, and left/right, etc. is an important early childhood basic skill. This little App will help making learning Position Words fun! Category Match! You can help your young learner gain important pre-number math skills with this easy and clear matching game. Matching shapes and colors, and learning the concepts of few-or-many and big-or-little are the basic skills necessary for understanding mathematical relationships. Happy Springtime! Developed for iPad, this Easter-egg-themed game for young learners (ages 3-8) will teach and reinforce discrimination and memory skills. 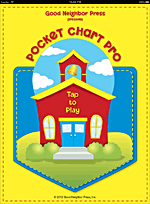 Play is based on popular pocket charts used in classrooms. Egg Match requires 3-5 minutes to complete, making this iPad app ideal for students with short attention spans or those requiring highly visual or tactile learning experiences. Happy Halloween! Teach young learners (ages 3-8) visual discrimination while they match cute and engaging Halloween images! Developed for your iPad, this holiday matching system will teach and reinforce skills necessary for school success. Match 'em up! And think about how much fun it will be to search for Snickers Bars in your little Halloween reveler's trick-or-treat bag! Happy Thanksgiving! Teach young learners (ages 3-8) visual discrimination and observations skills while they match cute and engaging Thanksgiving images! Developed for your iPad, this holiday matching system will teach and reinforce skills necessary for school success. Match 'em up! Soon it will be time for turkey and stuffing and cranberries and football and pie, pie, pie!! Merry Christmas! Happy Hanukkah!! Teach young learners (ages 3-8) visual discrimination while they match cute and engaging winter holiday images! Developed for your iPad, this holiday matching system will teach and reinforce skills necessary for school success. Match 'em up! What a great time of year! We wish you the merriest, jolliest holiday season yet! Teach young learners (ages 3-8) uppercase and lowercase letters of the alphabet with this simple and clever matching system. 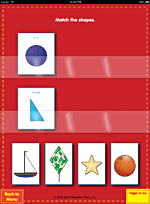 Letter Matching requires 3-5 minutes for a young learner to complete, making this iPad app ideal for students with short attention spans or those requiring highly visual or tactile learning experiences. Learning phonics is fun with your iPad! Teach young learners (ages 3-8) letter sounds with this simple and clever matching system. Beginning Letter Sounds requires 3-5 minutes for a young learner to complete, making this iPad app ideal for students with short attention spans or those requiring highly visual or tactile learning experiences. Learning phonics is fun with your iPad! 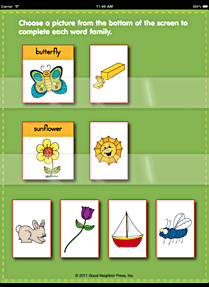 Teach young learners (ages 5-8) vowel sounds with this simple and clever matching system. 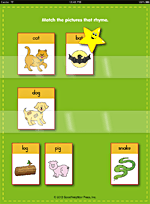 Vowel Sounds requires 3-5 minutes for a young learner to complete, making this iPad app ideal for students with short attention spans or those requiring highly visual or tactile learning experiences. Help develop language and literacy skills in early childhood learners (ages 3-8) with this simple rhyming matching game! Rhyming activities develop the phonological awareness necessary for literacy success. Plus, rhyme is just plain fun! Help develop phonics and literacy skills in early childhood learners (ages 3-8) with this simple matching game that teaches and reinforces ending letter sounds. Understanding how to decode words at an early age is an important component of literacy success! This little App makes phonics fun! Help develop phonics and literacy skills in early childhood learners (ages 3-8) with this simple matching game that teaches and reinforces consonant blends and digraphs. Understanding how to decode words at an early age is an important component of literacy success! This little App makes learning fun! 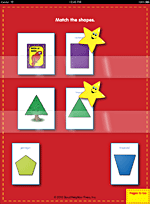 You can help your young learner gain important early reading skills with this easy and clear matching game. Recognizing compound words and how they are used is a basic skill necessary for literacy development. Help the young learners in your life become a proficient reader with this easy beginning spelling and reading game. Sounding out, reading, and spelling 3-letter words like c-a-t and h-a-t will help develop important early literacy skills. Help your young learner become a proficient reader! Learning word families, such as clam-ham-jam-yam, will teach your child to decode “chunks” of letters. Once these 72 one-syllable phonograms are learned, longer words will be easier to decode and read, too. Learning to count is fun with your iPad! 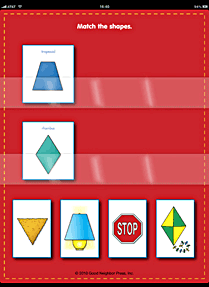 Teach young learners (ages 3-8) to count objects 1-20 with this simple and clever matching system! Counting requires 3-5 minutes for a young learner to complete, making this iPad app ideal for students with short attention spans or those requiring highly visual or tactile learning experiences. Number Match! 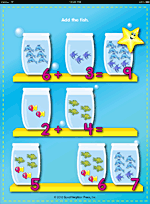 You can help your young learner develop early childhood math skills (ages 3-8) with this easy and clear matching game. Counting objects, then matching numerals, and their corresponding number words are taught and reinforced with this clever iPad App. 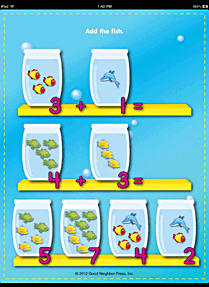 Help your young learner with early math skills! 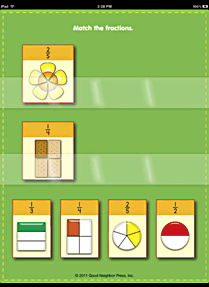 This simple matching game is a great way for young students to learn and reinforce identifying, renaming, and comparing equivalent fractions. This highly visual, interactive app uses representational, geometric, and numeral models for comparison. Early childhood science is best taught as ACTIVE EXPLORATION. Cabinet of Curiosities is a hands-on, minds-on science app. It allows students to engage in an action-oriented and inquiry-based approach to science. Each young learner will create his or her own “cabinet of curiosities,” a series of collections that require gathering data, taking photographs, and recording observations.